Bozeman is a city in and the county seat of Gallatin County, Montana, United States, in the southwestern part of the state. Kick off your visit on the 1st (Mon): get a new perspective on nature at Museum of the Rockies and then make a trip to Emerson Cultural Center. To see ratings, maps, photos, and more tourist information, refer to the Bozeman tour itinerary planning site . Dallas to Bozeman is an approximately 5.5-hour flight. You can also drive. The time zone difference when traveling from Dallas to Bozeman is minus 1 hour. Traveling from Dallas in April, things will get much colder in Bozeman: highs are around 56°F and lows about 28°F. Finish your sightseeing early on the 1st (Mon) to allow enough time to drive to West Yellowstone. The town of West Yellowstone has served as a gateway to Yellowstone National Park since the early 1900s. Kick off your visit on the 2nd (Tue): stop by Eagle's Store, find something for the whole family at Yellowstone Big Gun Fun, and then identify plant and animal life at Grizzly and Wolf Discovery Center. For ratings, photos, and more tourist information, go to the West Yellowstone road trip planning app . Drive from Bozeman to West Yellowstone in 2 hours. Alternatively, you can take a bus. Plan for little chillier temperatures traveling from Bozeman in April, with highs in West Yellowstone at 44°F and lows at 22°F. Wrap up your sightseeing on the 2nd (Tue) to allow time to travel to Glacier National Park. The glaciers from which Glacier National Park takes its name mostly dissipated eons ago, but they left behind a scoured landscape of high and steep mountain peaks, sparkling lakes, lush alpine meadows, and thick forests. 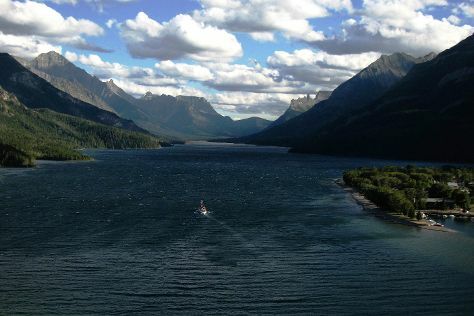 Spend the 4th (Thu) exploring nature at Waterton-Glacier International Peace Park. The adventure continues: take a memorable drive along Going-to-the-Sun Road, get to know the fascinating history of Garden Wall, take in the dramatic natural features at Jackson Glacier Overlook, and explore the activities along McDonald Creek. To find ratings, more things to do, other places to visit, and more tourist information, use the Glacier National Park trip maker website . Getting from West Yellowstone to Glacier National Park by combination of flight and taxi takes about 6.5 hours. Other options: drive; or do a combination of shuttle, flight, and taxi. Prepare for a bit warmer weather when traveling from West Yellowstone in April: high temperatures in Glacier National Park hover around 56°F and lows are around 30°F. Wrap up your sightseeing on the 5th (Fri) to allow time to travel to Little Rock. Once inhabited by Native American tribes, today Little Rock bustles with nearly 800,000 people. Change things up with these side-trips from Little Rock: Hot Springs (Garvan Woodland Gardens, Garland County Library, & more). There's still lots to do: contemplate the long history of William J. Clinton Presidential Library and explore the galleries of Little Rock Central High School. To see where to stay, ratings, reviews, and other tourist information, read Little Rock journey maker app . You can do a combination of taxi and flight from Glacier National Park to Little Rock in 10 hours. Other options are to drive; or do a combination of taxi and train. The time zone difference when traveling from Glacier National Park to Little Rock is 1 hour. Expect a bit warmer weather when traveling from Glacier National Park in April: highs in Little Rock hover around 72°F, while lows dip to 51°F. Finish your sightseeing early on the 8th (Mon) so you can travel back home.